Too soon? You be the judge… After The Return of the B-Girl, I was planning on reviewing RapSody’s second project, Thank H.E.R. Now to keep things nice and orderly. Until I came across her new video for A Crush Groove. And lost my freakin mind. I decided to jump back in my lil time machine and fast-forward to the present. The past can wait. Begin. When I hear the breathy voices of what might as well be bayou spirits emerging from the mists of the intro track, Pace Myself , my mind instantly references You May Die, the first song on OutKast’s ATLiens album (my favorite album of all time). So I grab the headphones. As the harmonies become clearer and more developed, I hear deeper voices that put me in mind of Boyz II Men’s Michael McCary, aka ‘Bass’. All of a sudden, the ethereal soundscape is shattered by a kick drum; an IMPOSSIBLE kick drum, with a swing so heavy that, as a rhymesayer, I feel totally uninvited to this event. Somebody needs to paint a picture of RapSody in stride, because I know some acclaimed MCs who aren’t that fire when their mouths are running full speed. Moving on, The Autobiography of M. Evans is a very “and if ya don’t know, now ya know” type of track. Based on the evidence presented, the ‘M’ stands for ‘Marlena’, as in Marlena Evans from the soap opera Days of Our Lives. Upon further investigation, however, it’s not Marlena, but Marlanna Evans who’s been gracing us with verse after verse of flat iron. And RapSody makes certain that we all know who she is with a historical profile of her years in the rap game. …The cold shoulders I coulda turned by now if only I had heard this track sooner. SHUCKS. But it’s good to hear rapper GQ give his testimony after RapSody’s done. I get happy when I hear about other cats not being taken advantage of. Go hard brotha. …Dag, I thought it was just me! While I got ya’ll listening, let me tell you like I tell my students: if you live a lifestyle where you feel you GOT to smoke weed to get by, that means you’re living too fast. It’s kinda like taking diet pills because you eat too much… just stop eating so much. As a lyricist, this is the kind of kill move I live to see. In case you didn’t catch it, the line is a wordplay: she substitutes the letter ‘S’ for the word ‘As’. A lot of MCs have the content and have the flow, but not many have the “masters’ finish”—that little, almost insignificant set of technical skills that the average listener is gonna miss at first. That capacity to produce a lyrical warning shot where it’s least expected, just to keep people nervous and observant. On top of all that, and the instrumental to ABC has true grit that really bares its teeth each time RapSody reaches the end of a verse. One of my favorite beats on the album by far. Serious note, this song has the potential to ignite change come this February; let’s commit to bangin’ it out whatever’s in the trunk til then. “Here comes a change, and another change, and another change…” I was drawn in by the bass of the filtered sample at the beginning of Rock the Bells. And after hearing RapSody’s take on the hip hop phraseology… I’m just glad she’s a Jedi and not a Sith. Or we’d ALL be force choked to sudden death by now. In a lyrical exercise kicked over a xylophone, Rapsody throws pause out of the window and lets the lyrics come rapid-fluid; I say ‘rapid-fluid’ because rapid-fire don’t flow like this. I understand America is #17 in education, but what more evidence could one possibly be looking for to prove that RapSody deserves acclaim at this point? Tell you what tho; I left a few tracks out of this review just for those with the nerve to want more. So if you’re not convinced, get the mixtape and peep it from start to finish. At best, the styles of the rappers you hear most over the radio are cute; RapSody’s style is for mature audiences who see through gimmicks and cheap punchlines. This writer says it’s time for her to blow up. And the fact that she hasn’t yet is not a commentary on her as an artist, but a commentary on us as listeners. Earwax is whack. And so is intellack. Fresh EGS! This is a DOPE write up! 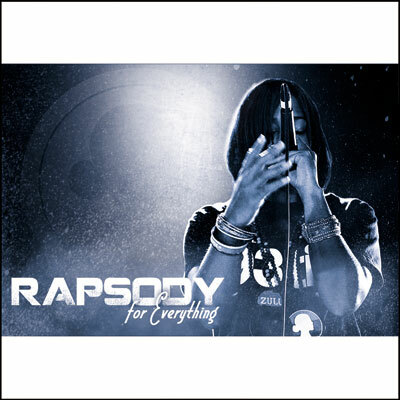 After reading about RapSody’s mix-tape, “FOR EVERYTHING” I am persuaded by your narrative to go “cop” it immediately. The figurative lines and references from her verses appears that she got some talent and other emcees (males/females) not to sleep on her. Big Ups to 9th Wonder for the uplink to this article. good stuff, lovin’ how you get in. Fasho! And be sure to peep my other write-ups, there’s a lot of artists slipping under the radar right now!